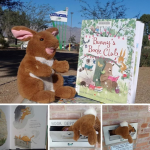 If you've been to Himmel Park Library recently chances are you've met Bun Buns, the resident bunny rabbit who loves books and hangs out in the book chute, enthusiastically accepting returns from young customers. 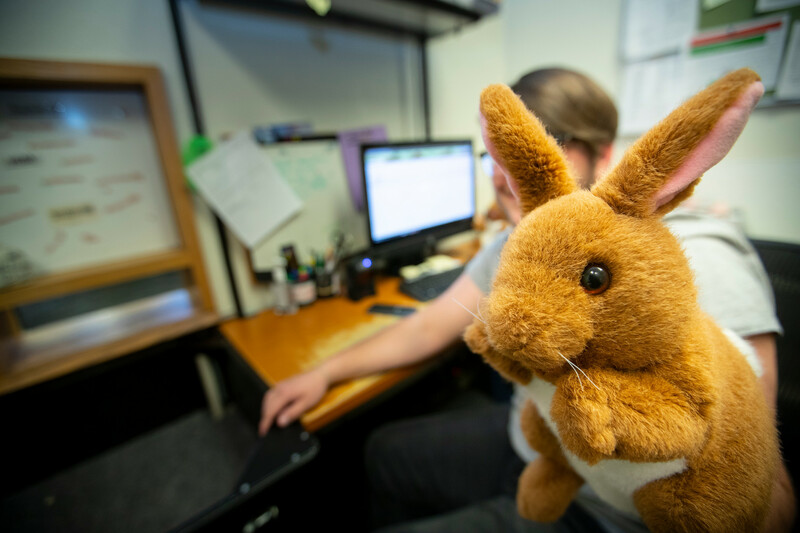 We recently sat down with Bun Buns to chat about the world's coolest job. 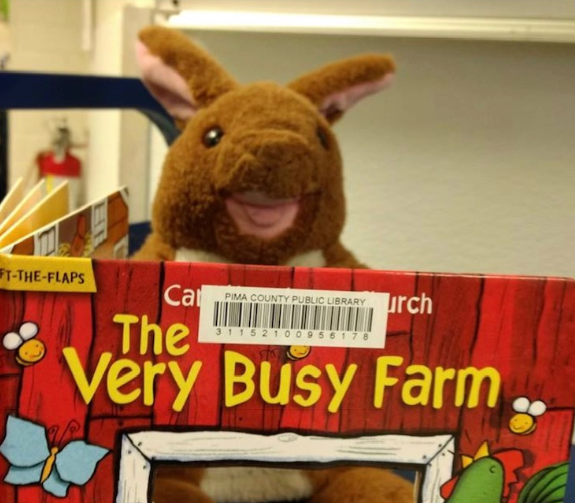 Bun Buns enjoys hanging out in the staff room while he’s not busy in the book chute.Bun Buns enjoys hanging out in the staff room while he’s not busy in the book chute. Some of Bun Buns’ buddies return books.Some of Bun Buns’ buddies return books. 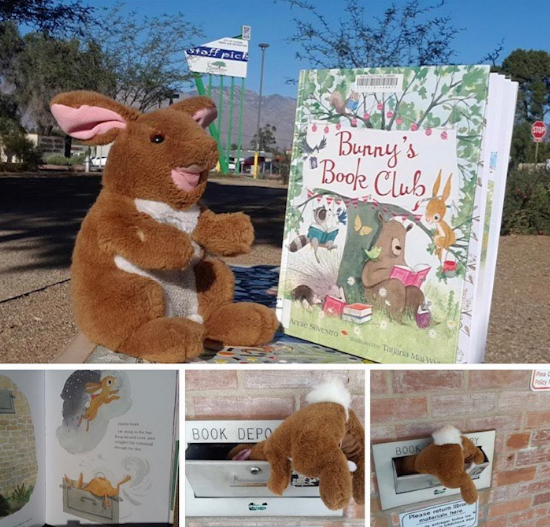 One of Bun Buns’ favorites, “Bunny’s Book Club,” tells the story of the lengths some animal friends will go to get into the library.One of Bun Buns’ favorites, “Bunny’s Book Club,” tells the story of the lengths some animal friends will go to get into the library. 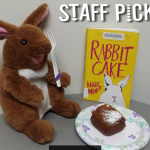 Bun Buns’ cousin, Honey Buns, hasn’t read this book but she really enjoyed the cake!Bun Buns’ cousin, Honey Buns, hasn’t read this book but she really enjoyed the cake! 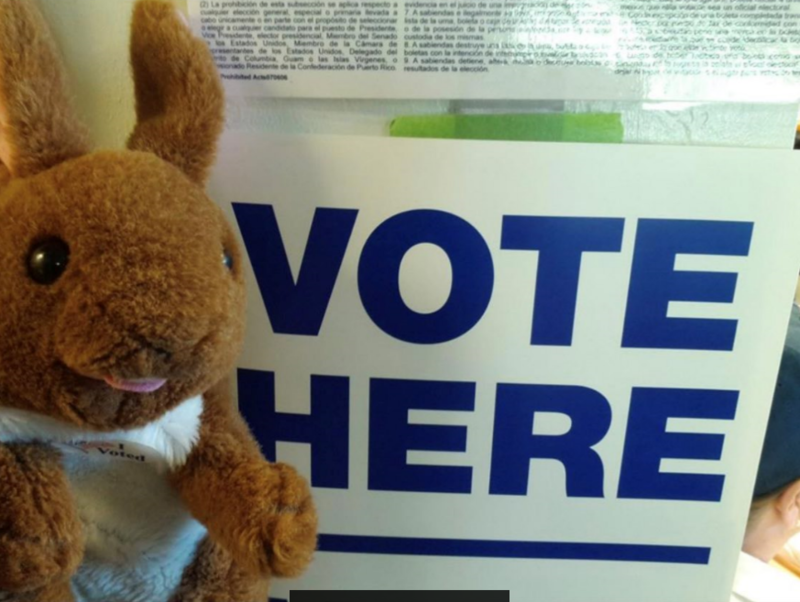 Bun Buns tends to vote for carrots and always encourages customers to to hit the polls.Bun Buns always encourages customers to hit the polls. 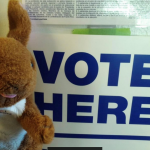 He tends to vote for carrots. 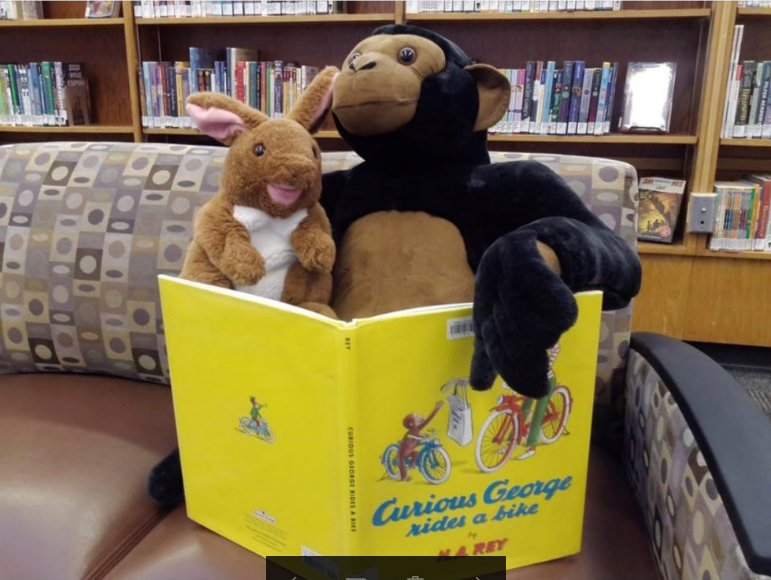 Bun Buns was completely starstruck when Chimpana visited (he looks like Curious George’s stunt double)!Bun Buns was completely starstruck when Chimpana visited (he looks like Curious George’s stunt double)! Bun Buns loved this story about “Tickles” the bunny.Bun Buns loved this story about “Tickles” the bunny. 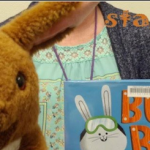 Bun Buns shared this story about a generous bunny named LaRue at a Toddler Storytime.Bun Buns shared this story about a generous bunny named LaRue at a Toddler Storytime. 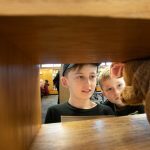 How long have you been at Himmel Park Library? It's been about 5 years. There were other animals before me, including a duck and a frog, but they didn't make the cut and I got the permanent job. My main duty is to check in the books that children hand me, but I'm always happy to say hello... and I love giving high fives to kids (and sometimes adults!). 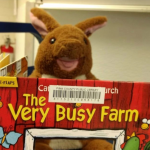 Most of the time the young kids coming into the Library head straight for the book chute exuberantly calling "Bunny!". I'm particularly busy on Storytime days. 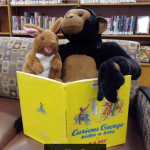 The book chute is a busy place, so my bunny cousin, Honey Buns, comes and helps me out from time to time. Check out all the fun we have in this video! 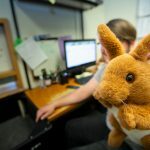 Did you work at other libraries before settling at Himmel Park? I did visit a few other libraries, but I really like this one the best. 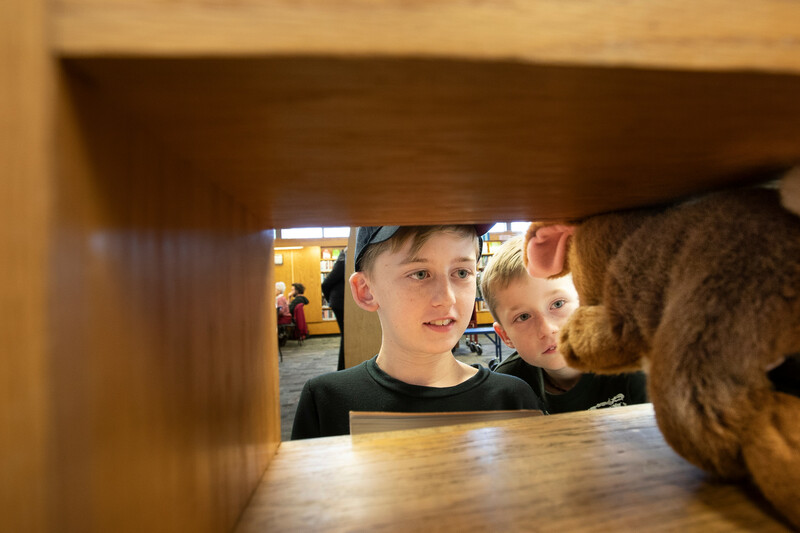 What would you say are some of your favorite moments at the Library? I love meeting new kids! My favorite is when preschool classes come to visit. It's always so much fun to say hello to a whole class of new children. I'm usually pretty busy inside the book chute. I really don't like to leave my post—it's a very important job, you know. I'd hate to risk disappointing kids who want to give me books. Storytime is so much fun, though, that I do visit sometimes as a special treat, especially when there's a bunny-themed story. How'd you get such a neat gig? I started as a volunteer and really impressed the staff with my friendly, attentive, hop-to-it spirit and ability to check in so many books. The staff here is kind. I'm excited to be part of the team! Where do you go after the Library closes? Well, the Library of course! I like to catch up on my reading... and peruse the refrigerator for carrots. Hmmm... tough question, too many to choose from. 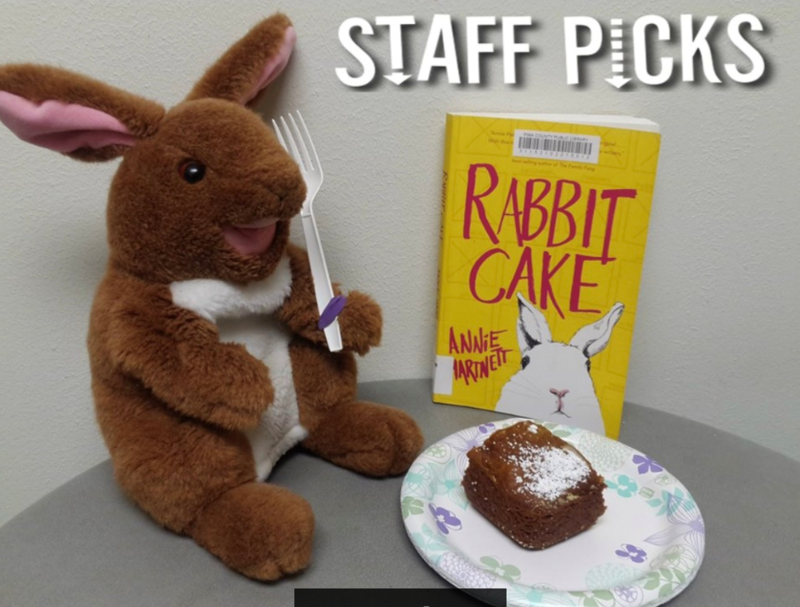 But let's see—some of my favorites include Bunny Built, Bunny's Book Club, Good Night Bunny, and How to be a Bigger Bunny. 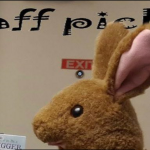 I also dig stories about Peter Rabbit. Oh! 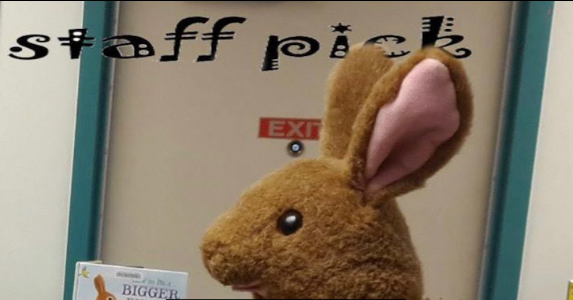 Sometimes the staff will put up my "picks" on their Facebook page. I've also been featured on the Library's Instagram account. Reading takes me beyond the book chute, of course! With books, I can travel all over the world and meet new friends without ever leaving the Library.